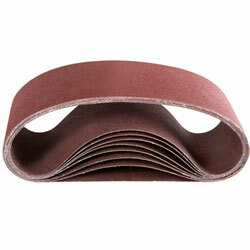 Wurth Ruby Portable Sanding Belts are the perfect combination of performance and value. Wurth only uses the finest Heat-Treated Aluminum Oxide for Ruby Belts. This results in a super tough, long lasting belt. Wurth’s unique ‘no load’ design means faster stock removal with less clogging. The belt material excels as only premium “X” weighted cloth is used. The ultra low-profile lap joint ensures low ‘chatter’ noise from your belt sander. While lesser belts will often leave grooves on your work, the Wurth Ruby Portable Belts will not. For the best in performance and value, make sure you use our Ruby Portable Belts on your sanding machines. Special “Open-Grain” belt design reduces loading grid heat. “X” weighted cloth for superior durability and performance. Cost Effective – High Performance. Premium Heat Treated Aluminum Oxide Abrasive. Stocked in a variety of sizes & grits.